Heroes come in all different shapes; this Peirce hero happens to wear a Marine uniform. Jonathan Turner first joined the military in 1989, and was on active duty in the US Marine Core until 1993. He fought in the Gulf War and was one of the first in combat. After being honorably discharged in 1993, he applied to work for SEPTA where he went on to be employed for 23 years. Despite having a busy career in transit, he still felt the need to serve and joined the PA Army National Guard in 1999. Things were good at first, but Jonathan was about to experience a significant change. During his time in the National Guard Jonathan didn’t just see combat, he was also deployed during Hurricane Katrina and Hurricane Sandy. He achieved the rank of Sergeant First Class, but despite his impressive service record he still felt like his life was missing something. Jonathan had served his country, gotten married, and had a wonderful family, but there was one thing he lacked: a college degree. Jonathan had to make sure that he went to college that would understand his unique education and scheduling needs, luckily he had heard about a certain school that sounded perfect for him from a friend. William’s glowing recommendation certainly helped Jonathan’s decision to go to Peirce, but what really impressed him about the college was its perks for military members. Peirce College is a Yellow Ribbon School, Service members Opportunity Colleges (SOC) approved, and has been included on the Military Friendly Colleges List for several years. The school has a variety of military scholarships available to help make earning a degree more affordable. At Peirce, military benefits also cover students’ spouses, so Jonathan’s wife Robin made the decision to go back to school with him. He liked that Peirce had excellent tutoring services and support, small class sizes, and a positive community. 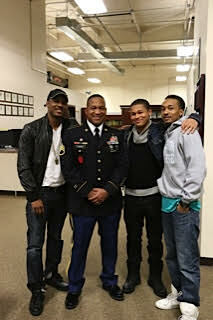 He was even given a student advisor that knew how to cater to his specific military background and needs. Jonathan started to study at Peirce in 2014, and is expected to graduate in 2017. His experience so far has been phenomenal, and he recommends it to other soldiers. “I’ve already recommended Peirce to my junior soldiers in my platoon and two of them have enrolled!” Jonathan exclaimed. He encourages other people, whether they’re military or not, to enroll in Peirce. Ready to start your Peirce journey? Click here. To experience the Peirce difference, click here.